The Way: an unspoken law heeded by all creatures. Take what you need, but never waste what you take. For eons all have followed this sacred trust. The Way demands that all creatures share in the balance of life: the ‘give’ and the ‘take.’ This creed does not, however, prohibit any individual, great or small, from doing everything in its power to stay healthy and alive. Rather, this is a requirement of The Way, which all beings accept as part of the dance of life. This is the story of a happy and prosperous tribe of People who have lived for generations in harmony with the land, the plants, and the animals. Upon awakening one morning, they discover that everything they have always depended upon to survive has disappeared. All the animals have departed, and the plants will no longer offer sustenance. Facing the threat of starvation, no one knows what has happened, or what to do. Taking it upon themselves to discover the truth, two young warriors – a boy and girl from the tribe – embark upon an epic journey to learn what has befallen their People. Carson Ellis is a student at Mount Holyoke College, majoring in Environmental Studies, with a minor in Art History. 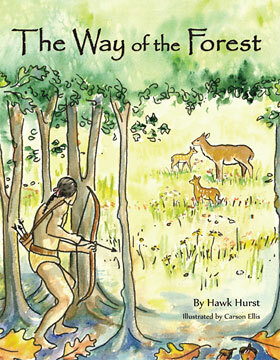 The Way of the Forest is her first professional work, the art inspired by a childhood living in the Blue Ridge Mountains, and four years working in environmental and outdoor education at the Green River Preserve summer camp. In addition to illustration, she is also interested in sustainable agriculture, and has spent a lot of time working on and managing various organic farm projects. For Carson, art is a way to explore and connect with nature. She hopes that her work will inspire other young artists to pick up a pen and to take a walk in the woods. For a free collection of interdisciplinary curriculum ideas, please click the highlighted link below. The lessons and activities are user-friendly and are designed for public, private, and home-schooled children of all ages. 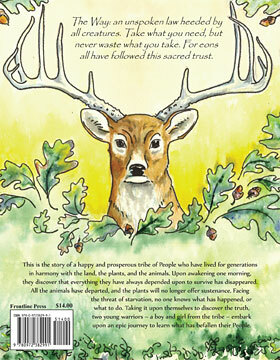 Naturalists, environmentalists and any lover of nature will enjoy the lesson plans. Subjects such as language arts, science, social studies, and other content areas have links for printable activities. You will find a literature list that will help you connect to other stories and extend learning opportunities. Several lessons were designed with national standards in mind to make the learning relevant to specific grade-level content. - Linda Stout, Editor, South Carolina Storytelling Network Journal. - Tony Bartelme, author, journalist and finalist for the 2011 Pulitzer Prize in feature writing. - Pamela Bauer Mueller, author of An Angry Drum Echoed and other historical novels. - Dr. Julie Sessions, Porter Gaud fifth grade science teacher. - Missy Schenck, co-owner, Green River Preserve.